Acme H4-W07D4 workstation, socket H4 LGA1151, DDR4 memory, GPU workstation, Black Color. Tower quiet (24db) case with 900W High Efficiency power supply, 80+ gold centified. 4 of 3.5" HDD bays. 2 of 5.25" open bays, one 3.5" bay. Width: 7.6 in. Height: 17.7 in. Depth: 20.68 in. 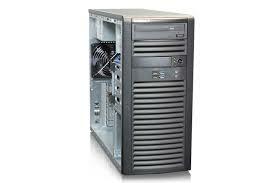 *** Processor, Memory, hard disk drive, VGA, GPU are not included. ** To make sure system quality, GPU should be sold and installed by Acmemicro engineer only.